Hail No Everything Must Go! Hail no! Everything Must Go! The vehicles will be sold on a first come – first serve basis! Once they’re gone, they’re gone. Five Star Ford of Plano assumes no liability for any hail damage related repairs or events other than repairs agreed upon at time of sale. Any future concerns related to the hail damage is the responsibility of the owner. 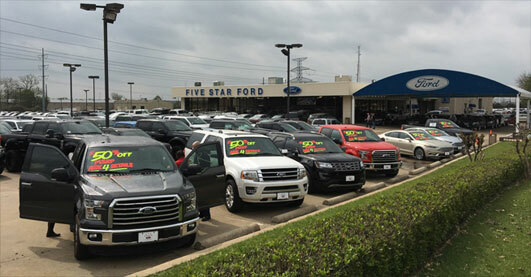 The customer also recognizes and agrees all efforts have been made in good faith by Five Star Ford of Plano to make aware and inform the customer of the hail damage disclosure. © 2017 Sam Pack’s Five Star Ford Plano. All rights reserved.